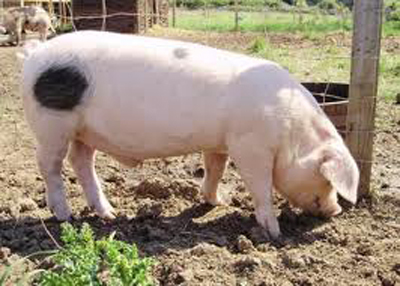 Gloucestershire Old Spots Pigs, or GOS hogs, are from Gloucestershire County, England. They are known for their docility, intelligence, and prolificacy. Boars reach a mature weight of 600 lbs (272 kg) and sows 500 lbs (227 kg). They are predominantly white with black spots and there must be at least one spot on the body to be accepted in the registry. Their maternal skills enable them to raise large litters of piglets on pastures. Their disposition and self-sufficiency make them attractive for farmers raising pasture pigs and those who want to add pigs to diversified operations.